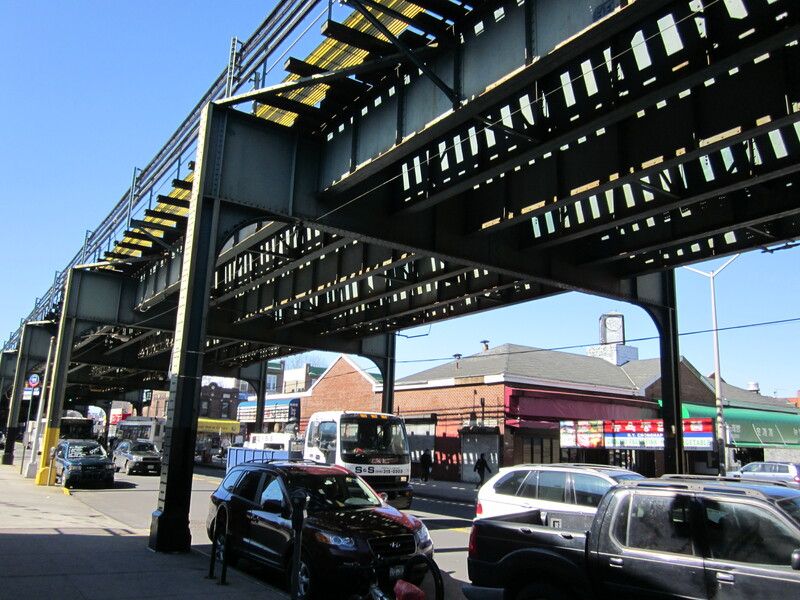 Just a few blocks from the Himalayan Yak and Braulio’s & Familia, Zio revisited the “epicenter” to discover Zabb Queens. As is his modus operandi, Zio scoured the internet food blogs and websites to find an appropriate destination for our group. His meticulous research unearthed a restaurant in the shadow of the elevated number 7 train tracks on Roosevelt Avenue in Queens, in the area he has referred to as our “outdoor food court,” also known in our circle as “The Epicenter” or “Ground Zero” for cheap, global grub. 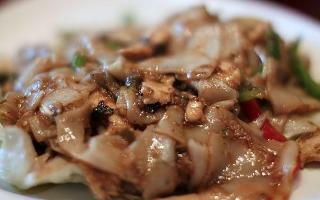 This one, a Thai place called Zabb Queens, was just a few train stops from our other favorite Thai restaurant, Arunee. Upon entering, I noticed a review from the New York Times prominently displayed. I pointed this out to Zio. A notice in the Times usually is a warning—a red flag that what was once an authentic local establishment would almost immediately become gentrified and dulled down to appease the masses. Zio just shrugged and I decided not to hold it against the restaurant. I had to keep an open mind. 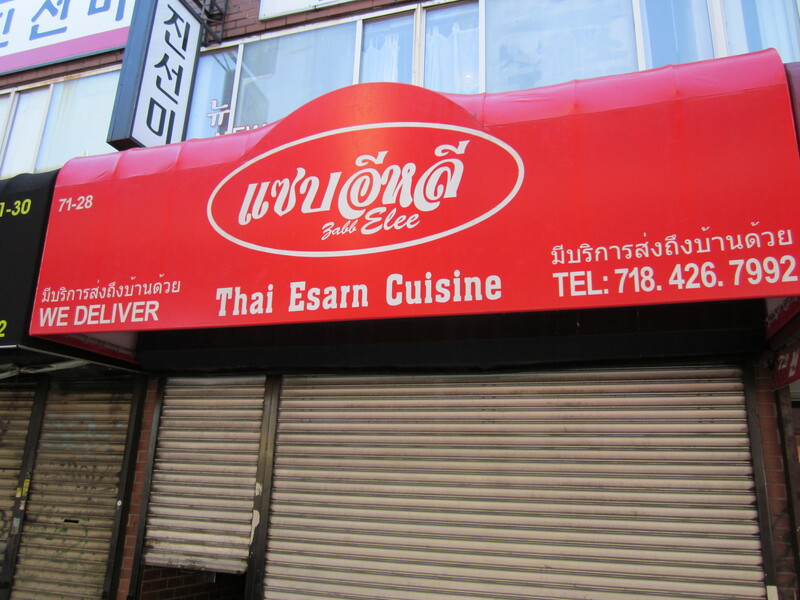 Zabb, unlike Arunee, advertised as “Esan” Thai food. Of course we were clueless as to what Esan might be but Eugene, always handy with the print outs of reviews of the restaurants we visit, pulled out his file on Zabb and we learned that Esan was actually Isaan, the northeastern province of Thailand and close to Vietnam and Laos. We had no idea what made the food of northeast Thailand different from what was prepared in the southwest until we took a look at the booklet that served as the menu and noticed a variety of organ meats; intestines, offal, hearts, liver, stomach, and pork skin. Along with the organ meats, catfish was also plentiful on the menu. This was Thai soul food. The clientele in Zabb’s narrow dining room was a mix of Asian and adventurous non-Asians like our intrepid group. Before ordering, we, pompously, explained to the eager waitress that we did not want to experience generic Thai food; we would not accept any compromises in heat or anything else—we wanted it the way she would have it. She understood and, though we passed on the chicken heart on a skewer, we bravely ordered the House special soup with liver heart and a choice of either pork or beef intestine. Don’t ask me why, but we decided on the intestine of the pig as opposed to the cow, and then to complement that, ordered the “pedestrian” tom yum soup with shrimp. A sip of the tom yum was anything but pedestrian. I immediately began to hiccup; a reaction I experience when something is so hot it is off the spice meter if there is such a thing. Hoping the House special soup would possibly cool my scorched palate I took a sip and chewed a piece of the aforementioned pig’s intestine. 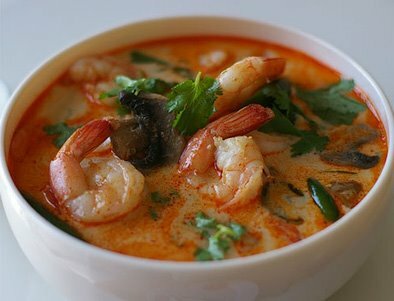 The heat from this soup, though not as brutally sharp as that of the tom yum, had more of a slow, yet just as fiery, burn. As my body adjusted to the heat, the hiccups calmed but the soups had elicited a sweaty sheen on all our brows with the exception of Mike from Yonkers , whose face remained dry and cool as he slurped down bowl after bowl. The BBQ beef in a spicy sauce was mild in contrast to the soups as were the trio of salads we ordered, green papaya with salted crab, crispy duck, and crispy catfish. The latter two, the duck and catfish, crisped beyond recognition. Zabb’s rendition of pad Thai noodles was not on the same level as Arunee’s, but the sautéed drunken noodles, the Thai version of chow fun, with a mix of seafood in a dry curry sauce, was the consensus winner and almost instantly devoured. Eugene would not leave until his request for a plate of chicken panang was met. We had no choice but to accommodate him and though he grumbled that we never received rice, he was ecstatic, immediately claiming that it was the best panang he ever had, if that’s worth anything. Dessert was orange-coated sweet doughy balls that were stacked in plastic take out containers by the door and the less said about them the better. Though the original Zabb Queens we visited in 2006 is gone, it has been replaced with an even less pandering Thai “Isaan” (or “Esarn” as it is spelled on the menu) place called Zabb Elee that doesn’t even bother to include pedestrian Thai like panang or pad Thai (sorry Eugene) but keeps those favorites like grilled chicken liver and chicken hearts along with pork legs soup. In fact, Zabb fever has gripped the city—at least the East Village—with two Zabb restaurants, a sister Zabb Elee and another called Zabb City. It’s encouraging to note that, at least in the East Village, there is now a demand for chicken hearts and snake head fish.